The most important factor in the case of space are the dimensions of your shuffleboard table. Shuffleboard tables run from 9’-22’. Shuffleboard tables for homes and bars are usually in the lower to mid-range sizes, or 9’, 12’, and 14’. Many commercial shuffleboards tables market shorter tables, while national and international tournaments play on the full-regulation size 22’ shuffleboards, and for good reason. The longer the table, the faster the weight will go, requiring more skill in determining the strength needed for the best weight slide. While the height of your table won’t make a difference in the floor space it’ll be taking up, it’s still something you should consider. The typical height of most commercial shuffleboard tables are around 30”-37” tall. This changes quite a bit if you’re planning to buy a table with an electronic scoreboard, so always be mindful of the height of the room’s ceiling. Each player will have their preference, but you should try to give players enough elbow room. Typically, the most effective size increase for comfort is from 2’-3’ past the table itself. This amount of room gives everyone the ability to easily fit in both standing and setting the pucks in motion. This space, of course, is only for the two opposite sides which the competitors will be standing. You can shirk down the space left between the wall and the table on either sides of the board. 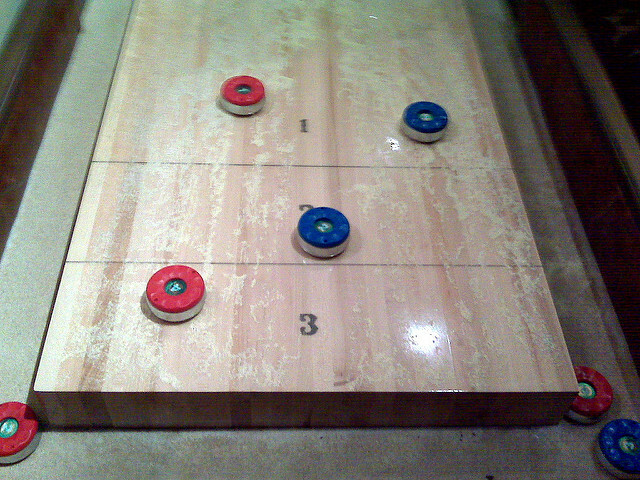 Most shuffleboard owners often find it to be a good choice to place one side of the table close to the wall. This will prevent it from moving in addition to saving space. For tables with an overhead electronic scoreboard, you should leave a few extra inches (anywhere from 3”-6”) so that it won’t move too much from the puck shuffling. With or without a scoreboard, you should still have enough room on one side to allow players or spectators to move freely. Commercial shuffleboards typically vary in widths from 21”-31” with the frame included. An additional 2’ on one side is sufficient, though players wouldn’t mind getting another foot or two for good measure. Before any player can set themselves up, the table they’re playing on needs to be constructed. Taking the clearance you have for your table will save you from broken pieces, and ruined walls or doorways. If you have any other pieces of furniture around the destined place of your shuffleboard, taking them out or moving them to one side will give you some peace of mind. Your doorway should be as wide as the table is high, or at least as wide as the table itself, to allow for proper room entry and assembly.